Cirque Shanghai returns to Chicago’s Navy Pier this summer with a magnificent new show “Cirque Shanghai: Dragon’s Thunder” beginning Wednesday, May 22, 2013. The production will run through September 2, 2013 (Labor Day), rain or shine, at the Navy Pier® Pepsi® Skyline Stage, the 1,500-seat, canopied, open-air theater on Navy Pier, 600 E. Grand Ave.
Tickets go on sale today and will be available via Ticketmaster at 800-745-3000 or www.ticketmaster.com/shanghai. “Cirque Shanghai: Dragon’s Thunder” is a spectacle for audiences of all ages, featuring performers direct from China who are leaders in their craft of tumbling, juggling, balancing and more. With a total of 36 troupe members, “Dragon’s Thunder” is the largest Cirque Shanghai cast to ever visit the U.S. This year’s production features an incredible line up of awe-inspiring acts, including “The Chinese Flex Bar,” the heart stopping “Gravity Swings,” and the awesome sounds of the traditional Chinese “Dragon Drums.” For the first time in Cirque Shanghai’s North American engagement, the traditional Chinese drums will be an integral part of the production. Back from last year’s show is the fate tempting “Wheel of Destiny,” and China’s finest daredevil motorcycle troupe, “Imperial Thunder,” returns with not two, not four, but five motorcyclists riding at break-neck speeds within a steel globe. 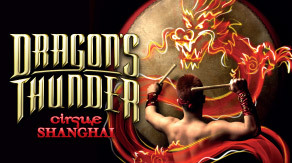 Directed by Miao Miao Chen, “Cirque Shanghai: Dragon’s Thunder” is presented in this exclusive U.S. engagement by Navy Pier in conjunction with International Special Attractions, Ltd. (ISA) production headquarters in Shanghai, China. There will be additional performances on Wednesday, May 22 and Thursday May, 23 at 10:30 a.m., Sunday, May 26 at 8 p.m., Monday, May 27 (Memorial Day) at 2 p.m. and 4 p.m., Thursday, July 4 at 2 p.m., 6 p.m. and 8 p.m., Sunday, Sept. 1 at 8 p.m. and Monday, Sept. 2 (Labor Day) at 2 p.m. and 4 p.m.
Tickets go on sale May 3 and will be available by calling 800-745-3000 or visiting www.ticketmaster.com/shanghai. Discounted tickets for groups of 10 or more are currently available by calling GroupTix at 773.327.3778 or visiting www.grouptix.net. International Special Attractions (ISA) was established in 1989 and over the past two decades has become a world leader in the production of large scale special attractions, events and theatrical productions. Last year, ISA presented The Ice Kingdom, a 13,000 square foot world made entirely of ice, at the Queen Mary in Long Beach, CA, the first time such an attraction had ever been created on the west coast. ISA’s other ICE! attractions can be seen annually at four Gaylord Hotel locations throughout the United States, and are enjoyed by over 1 million people worldwide each year. ISA was the first company to bring Chinese acrobats to Broadway and also produces Cirque Shanghai, which has performed in some of the most prestigious venues in the world. Additionally, ISA has produced Luminasia for the past three years at The Galt House Hotel in Louisville, KY. ISA clients have included The Walt Disney Company, Gaylord Entertainment, The Queen Mary, The New Victory Theatre in New York, Navy Pier Chicago, The Galt House Hotel, Busch Entertainment Corp and Six Flags, Inc. Featured Television coverage has aired internationally, on networks including NBC, CBS and ABC to name but a few. Haiping Ge was one of the earliest producers serving in the Shanghai government’s Office of Cultural Exchange Affairs. From that office, he hosted many of the first Western entertainers performing in China. For the last two decades, Haiping Ge has been producing shows with ISA for the world’s premium venues. His current productions include: Cirque Shanghai for New Victory Theatre on Broadway; ICE! attractions in Dallas, Nashville, Orlando and Washington D.C. in association with Gaylord Resorts; Luminasia at The Galt House in Louisville, KY, USA. Haiping also produced a Chinese acrobatic show for Disney World, Florida which will run through the end of this year. Miao Miao Chen is a second-generation performer as well as the show’s director. She studied with the internationally famous Shenyang Performing Arts Academy beginning at age five, and joined the acclaimed Shenyang Acrobatic Troupe, one of the top ten troupes in all of China, at age 13. Chen is the recipient of a Gold Lion Award from the International Acrobatics Competition in France, and received the top award for Best Innovative Performance in Uruguay. Chen has performed throughout the USA, Canada, Europe and Asia. In 2006 and 2007, Chen worked as a choreographer for “Le Grand Cirque” which has toured in cities across Australia, the United Kingdom and United States. Chen previously directed hit productions of “Cirque Shanghai” in 2009, 2010 and 2011. Located on Lake Michigan, just east of Chicago’s downtown, Navy Pier is the most-visited tourist and leisure destination in the Midwest, welcoming more than 8 million visitors annually. Originally opened in 1916 as a shipping and recreation facility, it is now one of the country’s preeminent recreation and exposition facilities, showcasing 50 acres of parks, gardens, restaurants, shops, attractions, sightseeing and dining cruise boats, exhibition facilities and more.